When picking up my prescriptions today (which you'd think was my hobby based on how often I do it) I made a fun discovery: my antidepressant is significantly cheaper this year than it was last year. So I guess now it's like a double antidepressant because I'm happy thanks to the chemical balance of serotonin, dopamine, and all that other science business PLUS I'm regular happy because I'm saving money. What an exciting life I lead! Later tonight I was making my dinner when I stumbled upon my next discovery. I'm pretty sure I'm 5 years old because my dinner was chicken nuggets and macaroni and cheese. This is not the first time in recent history that I've had that meal. And what's more, I'm totally cool with that. I spent all day yesterday organizing hundreds of pictures from my trip to China in a book on Picaboo. I can't wait for the book to come in the mail! I had so many fun times in Shangri-la and I hope to go back soon. 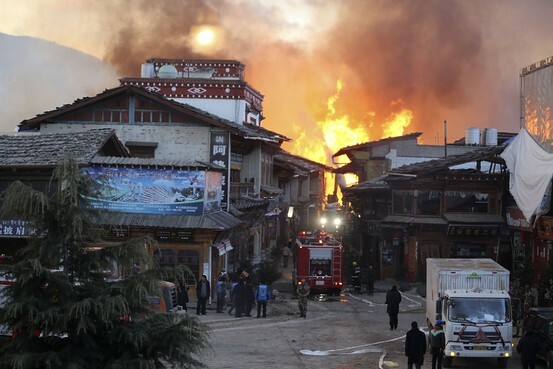 There was a sadder aspect to going through all the pictures, on January 10, 2014 a fire destroyed most of Old Town in Shangri-la. Old Town is where I stayed while I was in China. We shopped in the small shops of Old Town and ate in the local restaurants. We met people who owned the restaurants and shops. And now from what we've heard, they're all burned to the ground. I'm so lucky to have visited all of these places before they were gone. According to a recently released story, the fire was caused by an unattended heater in a guest house. Thankfully, no one was hurt. The fire burned for 10 hours. That blows my mind. One unattended heater causing 10 hours of uncontrollable blaze and destroying a town. It breaks my heart. What will it look like when I go back?